JK Front Crusher Flares Narrow Width (Steel) for Jeep Wrangler JK 2007-2016. These Narrow JK Crusher Flares are 2 inches narrower than our Standard Width Crusher Flares. This gives you 2 inches of extra clearance from canyon walls, trees and obstacles on tight trails. The Jeep JKs thin sheet metal fenders and Stock plastic flares are among the most vulnerable body components when traversing the trail. The Poison Spyder JK Front Crusher Flare kit improves both the aesthetics and durability of your Jeep during your off road adventures. Steel Crusher Flares and Poison Spyders exclusive Inner Brace system are the ultimate in front fender armor for your JK, with the toughness to withstand punishing scrapes with granite canyon walls. This product ships as bare steel it will need to be painted or powdercoated prior to final installation. We do Not offer a powdercoat option for this item. Every set of Poison Spyder JK Crusher Flares comes with a set of inner braces that tie the Crusher Flare in to the sturdier, heavier-gauge steel of the JKs inner body tub structure. Competitors JK Flare products simply bolt directly to the outer layer of the JKs body sheet metal. But as any JK owner kNows, the exterior sheet metal is very thin and flexible. Simply bolting a heavy duty fender directly to the exterior sheet metal without the inner bracing is a disaster waiting to happen. Regardless of how sturdy the flare is built, upon contact with rocks, trees, etc., it will simply push in and deform the flimsy sheet metal it is bolted to, possibly causing expensive and unsightly damage. The Inner Brace Set that comes with Poison Spyder Crusher Flares effectively bypasses the outer sheet metal, instead transferring those forces to the much stronger inner structure of the Jeep. Thats why weve been able to demonstrate the strength of our flare attachment system by parking aNother Jeep on top of the Crusher Flare! These Inner Braces are CNC laser cut, brake-formed for a great fit and simple installation. JK Front Crusher Flares come with high quality rubber liners to place between the Crusher Flare and the Jeep body sheet metal during installation. The rubber liners provide help protect your Jeep exterior paint, where the flare contacts it. It also helps even out the contact area of the Crusher Flare, absorbing any small bumps or imperfections between the mated surfaces. The rubber liner also helps keep moisture, dirt and debris from collecting between the Crusher Flare and the Jeep body. These liners are cut from premium EPDM rubber. When installing Poison Spyder JK Front Crusher Flares you have the option of retaining the factory wheel well liner to protect the engine from trail and road debris. Retaining the wheel well also helps to conceal the Inner Braces to complete a clean and finished appearance. Some trimming of the plastic wheel well is required, but the kit comes with hardware and mounting brackets to re-install the trimmed wheel well. The JK Front Crusher Flare kit comes Standard with mounting provisions to replace the factory side marker with a high intensity 3/4 inch round LED marker light. The addition of the LED provides a more modern and refined look that complements the function and style of the Crusher Flare. Not sure whether to choose steel or aluminum for your Crusher Flares? 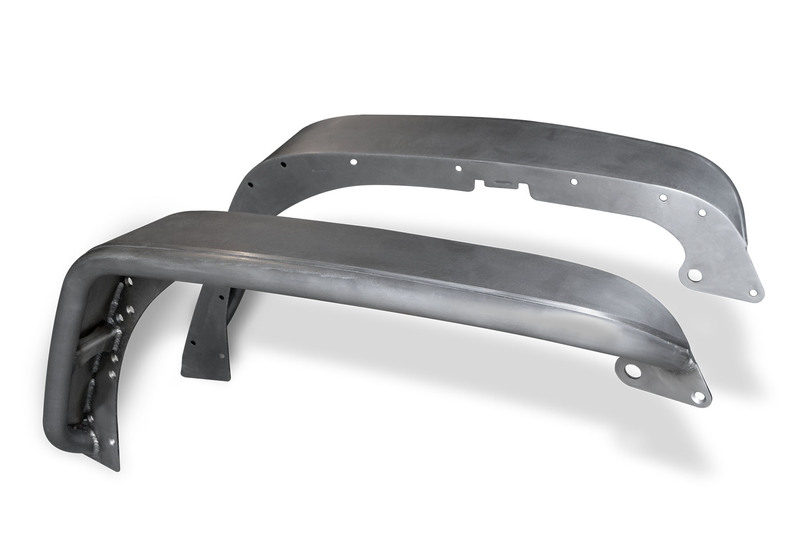 Aluminum is lighter in weight, so might be the best choice for those looking to save weight on their heavy JKs in order to improve fuel mileage and gain an advantage off-road. However, when wheeling with aluminum flares it is up to the driver to use more care and finesse, as the aluminum components are Not going to be able to withstand the same direct impacts that steel can. The outer tube on our aluminum Crusher Flares is beefy .188 wall thickness. Compared to our steel Crusher Flares which use .120 wall DOM steel tubing. The thicker tube wall recoups some of the strength lost by going to aluminum, however the steel versions will still be stronger in a direct impact with the rocks. For reference, a steel JK Front Crusher Flare weighs 31.6 lbs (Not including hardware), while an aluminum one weighs only 11.8 lbs. Which is best for you will depend on your particular intended use of the Jeep, driving style and other factors.